This customer, who lives in the small village of Cobham had the unique situation of having been abroad for six months, leaving her adult children in charge of the house. 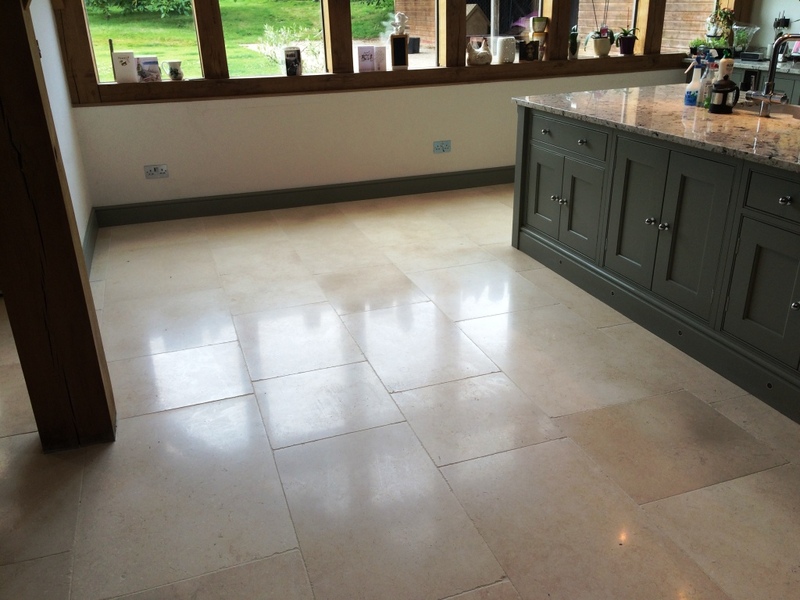 During this time, the fantastic Limestone tiled floor in the kitchen had not received adequate maintenance and its appearance had rapidly degraded. To make the situation worse, it seemed to me that the wrong products had been used on the rare occasions that it had been cleaned. 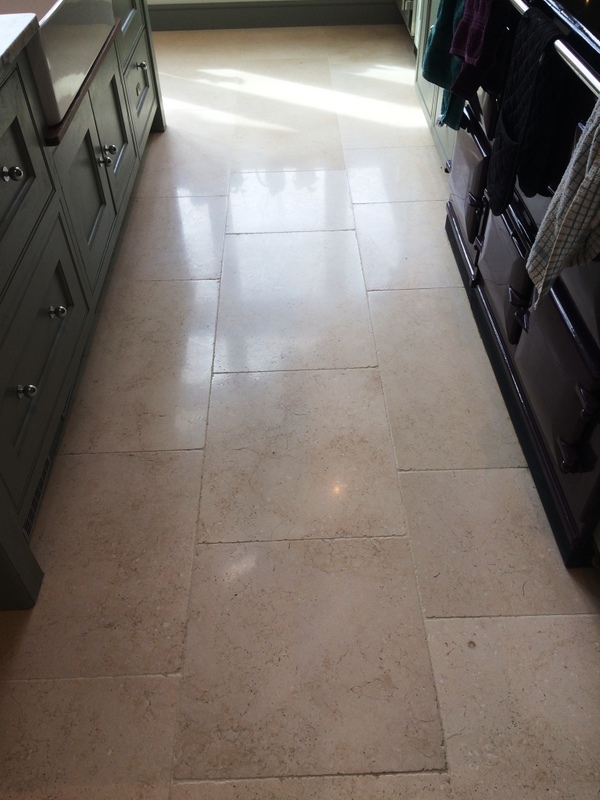 With the customer now back in the UK and living in the house again, he was keen to have the Limestone tiles restored to their original condition. He contacted me to get the job done. 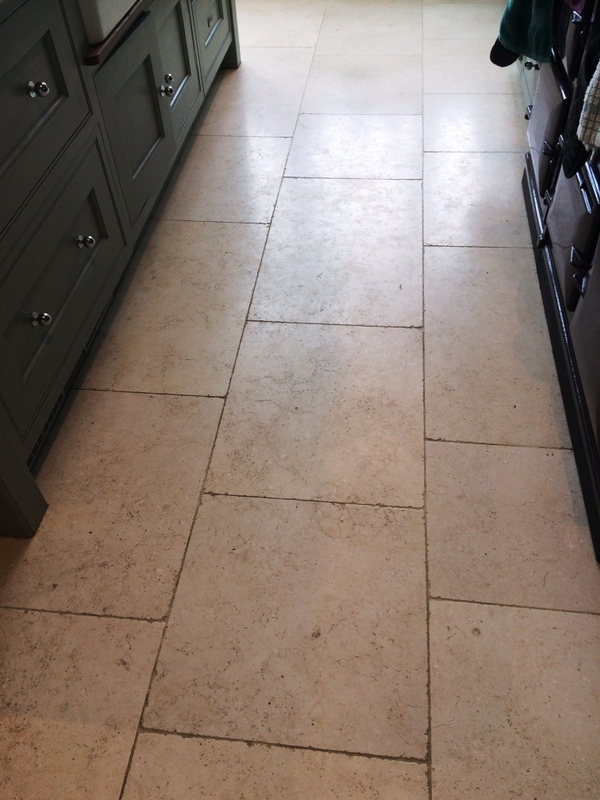 My first task was to tackle the dirty grout lines between the Limestone tiles, which were brown and stained. Tile Doctor Pro Clean, which is our reliable alkaline-based tile cleaner, was applied with a grout brush and the stains immediately vanished. 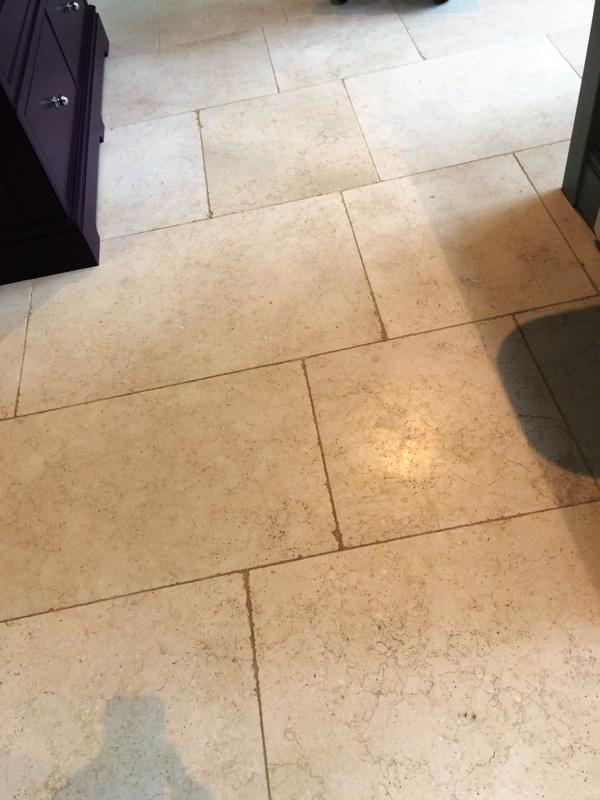 The next stage of the restoration involved polishing the Limestone using our four-pad Tile Doctor diamond-encrusted burnishing pad system. Firstly, I applied a Coarse 400 grit pad to strip away what remained of the old sealer which had been worn down in the high traffic areas of the floor. I then applied the Medium 800 grit and Fine 1500 grit pad to gradually close the pores of the stone which, in turn, restores the polished effect. Each pad is used in combination with a small amount of water and any excess moisture is removed with a wet vacuum. To end the first day of work, I left the floor to dry and arranged to return in 48 hours to finish the job with sealing. Upon my return, I ran some quick damp tests to check the floor could be sealed and quickly polished the surface again using a soft white nylon pad to remove the paw prints caused by the customer’s dog in the interim period! Next, using a small quantity of water, I used the Very Fine 3000 grit burnishing pad to hone the stone to its highest possible quality. Once dry, I applied to the floor two coats of Ultra- Seal, which is a penetrating sealer designed to provide maximum stain protection while providing a natural look finish. One final polish later and the restoration was complete.